You will totally impress your friends with this one! Elegant mini chocolate mousse tarts, with a fruity center. They are classy ladies, I tell you. Starting with a simple crumb crust which we have made before for a cheesecake, you can whip these up on a weeknight if you’d like, its so simple! Feel free to change out the chocolate Teddy Graham crust with another chocolate cookie or a graham cracker even. I used my food processor to get the crumb extra fine, but last time I did it, I literally just took out the frustration of the day on cookies (and damn did it feel good). 2 / Stir together all of the above ingredients until all the ingredients are evenly distributed with each other. 3 / Butter the sides and bottom of your standard 12-cup cupcake pan. 1 / In a large metal bowl, set over simmering water, stir the coffee and milk together until resolved. 2 / Add the chocolate to the mixture, while still heating on the stove, and stir frequently until the chocolate is completely melted. 3 / Remove the bowl from the stove and add the eggs and flour, mix until completely combined. Set mixture aside. 1 / Preheat oven to 325˚F. 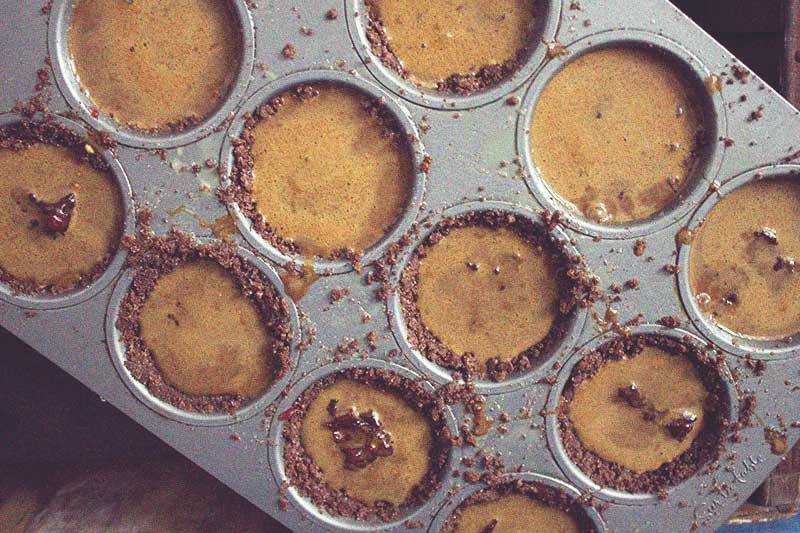 Remove the cupcake pan with the cookie crumb cups from the refrigerator. 2 / Spoon about 2 tsp. - 1 tbsp. jam into the center of each chocolate cup. 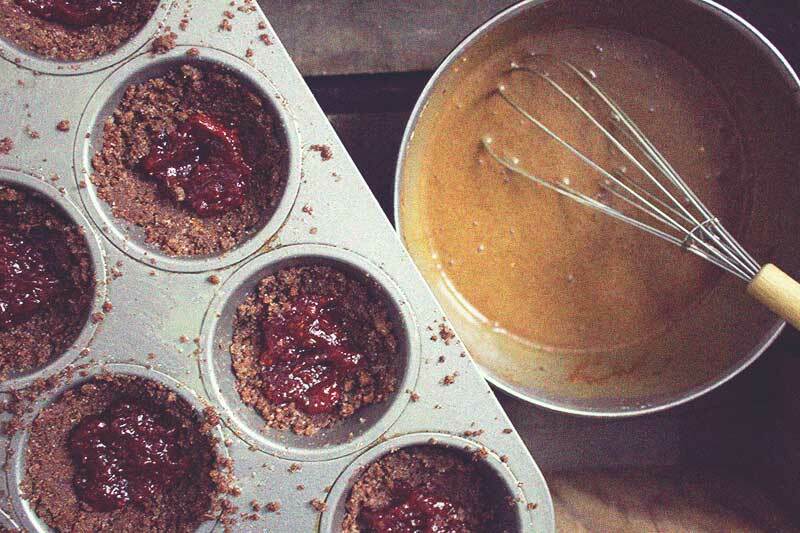 3 / Pour ¼ cup of the mousse mixture into each jam filled cup. 4 / Bake for 18 minutes, remove from oven and allow to sit at room temperature for 10 minutes before serving. After they set for 10 minutes, run a knife around the edge of the cup to separate them from the edge of the pan so you can pop them out. They make look like they need to be baked longer, but DON’T DO IT! The mousse will set, I promise, and it will be perfection. The mixture of crunchy chocolate, fruity center and velvety chocolate coffee mousse is just DIVINE! These babies are rich, so be prepared with a cup of milk! Like I said earlier, they are super quick to make, and very versatile. Graham cracker crust, orange marmelade and the chocolate coffee mouse?- AMAZING. Chocolate crust, cherry jam and chocolate coffee mouse? - I'LL TAKE 'EM! What flavor combination will you make?